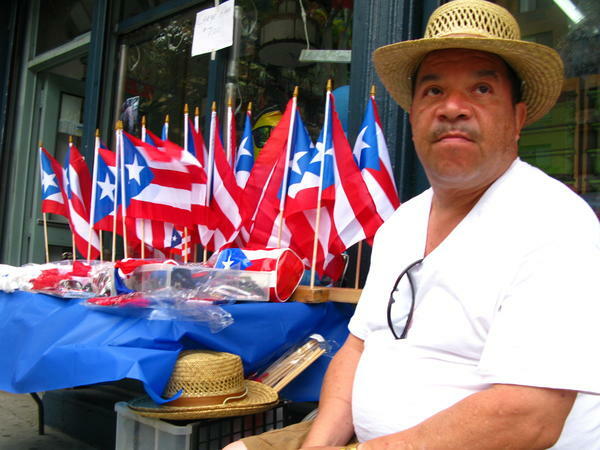 Longtime East Harlem resident Johnny Montanez, 53, says he sells Puerto Rican flags and T-shirts a few doors down from his apartment building to show that Puerto Ricans are "still here." Marching bands, beauty queens and Chita Rivera are set to make their way down New York City's Fifth Avenue on Sunday for the annual Puerto Rican Day Parade. With 80,000 marchers and 2 million onlookers, the event is one of the country's biggest ethnic celebrations. In the run-up to the parade, rows of street vendors have lined up north of the parade route, in New York's East Harlem neighborhood — also known as Spanish Harlem for the wave of Puerto Ricans that settled here after World War II. These days, this neighborhood is where Gerardo Cruz can help you gear up before the parade. "I got straw hats, souvenirs, necklaces, headbands — you name it!" says Cruz, as he shows off his tables of merchandise, all emblazoned with the words "Puerto Rico" or the colors of the island's flag — red, white and blue. His biggest moneymakers, though, are T-shirts and actual Puerto Rican flags. "I could sell maybe 20 big flags [a day]," says Cruz, who has found a sweet spot of heavy foot traffic and plenty of potential customers at the corner of 116th Street and Third Avenue. His competitors and their tables of parade gear, though, are set up just down the street, behind the throngs of shoppers, couples and baby strollers. Cruz, 62, was born on the Caribbean island but has spent most of his life on the island of Manhattan. After retiring a few years ago, he moved to Florida, joining one of the country's fastest growing Puerto Rican communities. But in terms of Puerto Rican Day parades, New York City's event still takes the cake with its millions of parade watchers. The city is also still home to the largest Puerto Rican community in the United States, at more than 700,000. Since 1990, there has been a steady drop in the number of Puerto Ricans living in New York City overall, while the numbers of Dominicans, Mexicans and other Latin Americans are on the rise. Puerto Ricans still make up the city's largest Latino group, and their pride in their heritage has not wavered. Whenever the parade is in town, just look for the flags. Marching bands, beauty queens and Chita Rivera are set to march down New York City's Fifth Avenue tomorrow for the annual Puerto Rican Day Parade. It's one of the country's largest ethnic celebrations, with 80,000 marchers and two million onlookers. In the run-up to the parade, rows of street vendors have lined up north of the parade route in New York's East Harlem neighborhood. Hansi Lo Wang of Code Switch, NPR's reporting team on race, ethnicity and culture, has this postcard from New York City. GERARDO CRUZ: Necklace, headband, you name it. WANG: Do you have underwear? CRUZ: No underwear, but I got that, look. WANG: You got the bikini. CRUZ: The bikini for the girls. WANG: Swimwear demand, though, can't compete with Cruz's biggest moneymakers: T-shirts and those Puerto Rican flags of red and white stripes and a single star against a blue triangle. How many do you sell a day? CRUZ: Oh, I could sell maybe about 20 big flags, it depends. 'Cause everybody else got the same type of merchandise. WANG: And by everybody else, Cruz means his competitors with their tables of merchandise just down the street. You can barely see them behind the throngs of shoppers, couples and baby strollers. Cruz has found a sweet spot of heavy foot traffic and plenty of potential customers at the corner of 116th Street and Third Avenue, where he parks his electric blue car by 9 am and cranks up some salsa beats. WANG: And sometimes sings a few bars of his own. CRUZ: (Singing in foreign language) I'm a Boricua, in other words. CRUZ: I live in Florida now. WANG: You live in Florida? WANG: So, you come here for the parade? WANG: Cruz may have left New York for Florida and joined one of the country's fastest growing Puerto Rican populations, but in terms of Puerto Rican Day parades, New York City's still takes the cake with its millions of parade watchers. And the city is still home to the largest Puerto Rican community in the United States at more than 700,000. Since 1990, there has been a steady drop in the number of Puerto Ricans living in New York City, and the number of Dominicans, Mexicans and other Latin Americans are on the rise. But Puerto Ricans still make up New York's biggest Latino group. And their pride in their heritage has not wavered. Whenever the parade is in town, just look for the flags. Hansi Lo Wang, NPR News, New York. SIMON: This is NPR News. Transcript provided by NPR, Copyright NPR.